This small tree is common on campus and in the surrounding woodland. Features include the large, broad leaves to about 9 x 6 cm, the flattened petiole with a small wing on either side; the flowers that have white petals (about 4 cm long) and numerous stamens (about 5 cm long) which are pink and white and fused into a short tube at the base. Flowers open late in the afternoon and by mid morning all the petals and stamens are forming a carpet on the ground. The green fruit is about 5 x 3.5 cm, it is edible but not very tasty. Flowering late spring. JCU acknowledges the Yirrganydji and Djabugay Peoples for sharing their Indigenous Knowledge and pay respect to the elders past and present. “Known as Parr-jal. Fruits are edible. Medicine made from tree to treat wounds and infections. 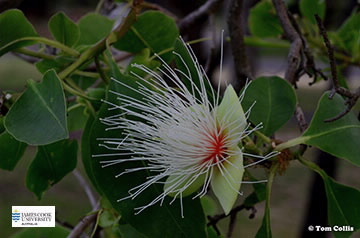 The tree used as a fish poison”.